One thing I like about Panera Bread is that its Canadian and American menus seem to be pretty consistent. A lot of times there’ll be an interesting item introduced on the menu at a fast food joint, only for it never to materialize here in Canada (like KFC’s boneless chicken, McDonald’s Egg White Delight McMuffin, or Taco Bell’s Doritos Locos Tacos, among many others). Panera Bread, on the other hand, seems to actually let Canadians try its new menu items, which is nice. 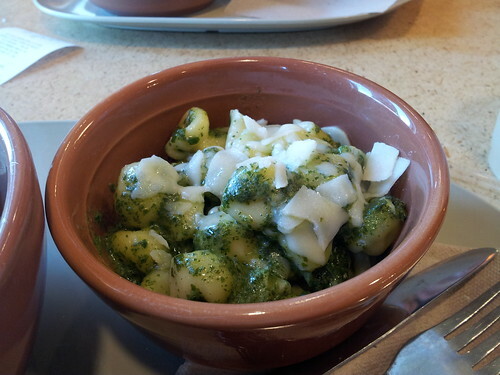 The latest thing at Panera is pasta. They’ve got Tortellini Alfredo, Pesto Sacchettini, and Rustic Penne Bolognese. I went with the Sacchettini, which is described as a “purse-like pasta filled with six cheeses.” Pesto? Six different cheeses? Sign me up. There’s a choice between small and large, and though the small initially seems comically undersized, it’s actually fairly heavy and a good amount for lunch. It’s not bad. It is, as advertised, quite cheesy, and the generous amount of pesto clinging to each Sacchettini gives it a good amount of flavour. It was, however, unevenly hot in the way that only food that has been quickly microwaved gets. It’s also pretty much the opposite of al dente, with pasta that is disconcertingly close to Chef Boyardee in the texture department. It comes with either a soup or a salad. I got the Classic Salad, which is dressed with a passable balsamic vinaigrette. It complimented the pasta fairly well; the occasional bite of the vinegary salad helped to cut the richness of the oily, cheesy pasta (and the pasta is definitely not kidding around with the oiliness — when I finished, there was a pretty substantial pool of oil at the bottom of the bowl). It’s not bad, but at the price I don’t know how heartily I can recommend it. I got it with a lemonade to drink, and it came up to almost 15 bucks, which is kind of absurd for the caliber of food you’re getting.